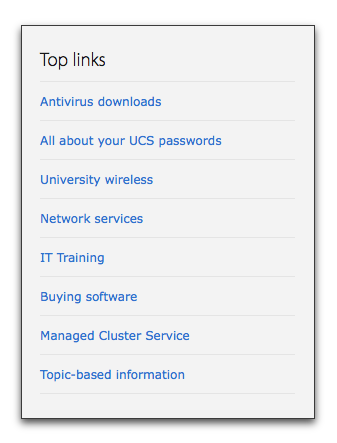 When you first look at your site, on the home page you will see a 'Manage portlets' link at the bottom of the page. If you add right-hand portlets to the home page, they will be used on any other page you add to the site unless you change the settings on that new page to block them (see below for how to do this). On the teaser home page you can add portlets in the main content area as well as to the right side - on all other pages you only get the opportunity to add a main picture or carousel plus portlets on the right side. When starting with portlets, the best place to think about first is your home page. Portlets that are added to the right of the home page will be inherited through folders in the site unless you block them, but don't let that influence you as it is quite an easy task. First decide if you want to block the right-hand portlets on a single page or the whole folder. If you want to block the whole folder, click the link in the yellow 'Info' box to go to the folder. If you want to block the portlets just on a single page the go straight into the following. Carousel portlet: The carousel portlet is only usable on sites using the old templates and will be removed once all sites have been migrated. Collection portlet: Information to come. Events: Along with separate but similar portlets for News and Jobs, this portlet collects the titles of Events and displays them as a list with a link to the full entries. You can select how many items to display - you should leave the Workflow state as configured, unless you have special reasons to do otherwise. 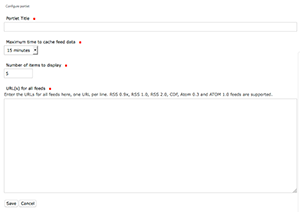 To add a single RSS feed portlet, the set-up screen is very similar but only a single rss feed can be added. Do be aware that Falcon will not publish badly structured (invalid) feeds - the Feedmixer portal will not work at all if one of the feeds is badly structured. 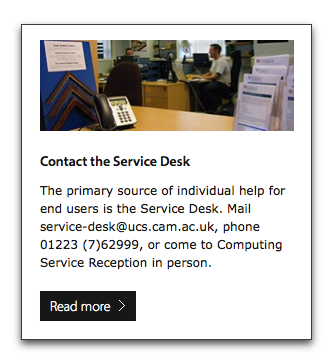 The RSS portal has been set up to recognise RSS feeds from talks.cam and alter the footer text accordingly. Additional information is available about Finding the URLs of RSS feeds. Once the lines for the URLs and link text have been added, the order can be changed by moving lines up and down with the arrow icons. Lines can be added and removed using the + and - controls. 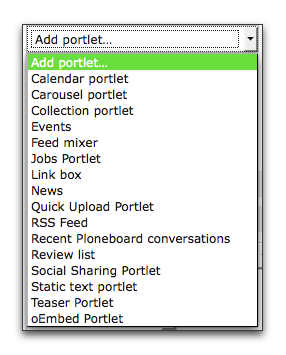 Quick Upload Portlet: Add this portlet to a folder to allow quick upload of multiple files or images. You just need to use the default configuration for it. Recent ploneboard conversations and Review list: These portlets are for specialist use, the first for showing activity on any forums/message boards you have one the site, and the second for showing to the site managers any pages from contributors that need to be published. You can use this to add an image or an iframe and remove the border, by checking the box next to 'Omit portlet border'. The image used should be sized to 349 x 125 px.